I’m becoming more regular with posting an update on my cross stitch. I like it and keeps my engaged with the project. Once all the cross stitch is done, I’ll be doing the embroidery part. I don’t consider it embroidery but I don’t know what else to call it. I have to outline the letters and add the details on the flowers, etc. I did it for the left half but haven’t done anything on the right half. I may start doing some of it now so that I don’t have to do a lot of it once I’m done with cross stitch. Once it is completely done, should I wash the project? I know I’m going to try to get the stain off at the bottom (that you can’t see). But I was wondering if it’s normally done for cross stitch projects. I’ve finished 2 cross stitch projects in my life. My first one, I gave to my Aunt. She had it framed and when I bought my first house, she gave it back to me to put in the house. I don’t know if she washed it before she had it framed but I don’t think so. The second one, I have in the main restroom and I had it framed. I know for a fact I didn’t wash it and I wish every day that I did something to it. I’ll have to post a picture one day and discuss it. 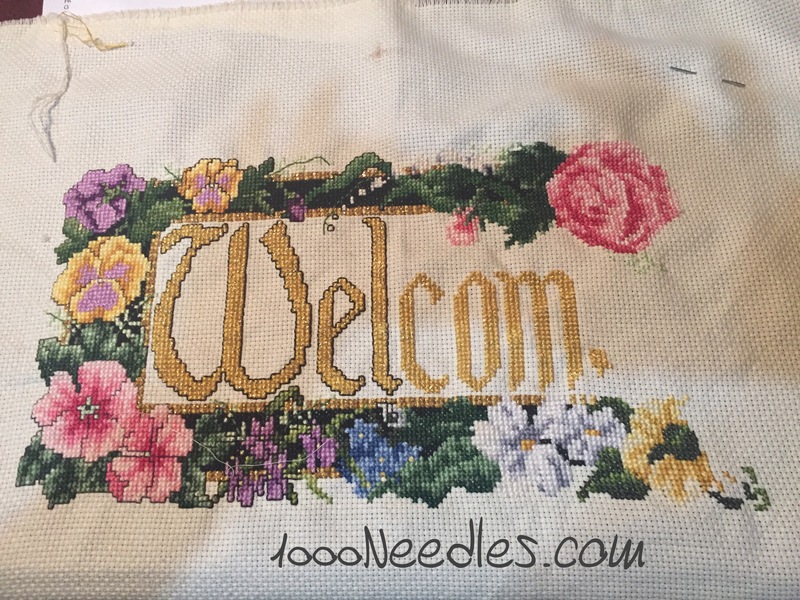 Anyway, does one wash a cross stitch project (assuming nothing is wrong with it and it’s not dirty)? I would guess no since you wouldn’t want any of the colors to bleed and cause a mess. Why fix something that’s not broken. But just checking with you. The professional framers I’ve used have always washed projects I’ve left with them, but one did say that if there are a lot of saturated colors, especially reds, they take it case by case. Not only can washing get spots and skin oils out you might not have noticed, apparently a damp project is easier to stretch and block well, especially if it has folds or hoop marks. You’ve come a long way on that one. I’ve no experience with having this type of needlework framed, so I hope you find a good framer who will do it just right!